Sonequa Martin-Green and Michelle Yeoh look stunning in their Starfleet uniforms and now you can too. The Star Trek Discovery Women’s Gold Command Uniform features a long-sleeve blue collared shirt with inner lining. 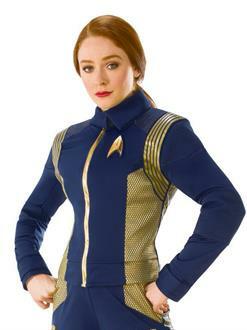 It features a gold Starfleet emblem on the chest, gilded accents on the sides and gilded shoulder braids.